Aspinal's indispensable Classic Travel Wallet is the perfect companion to accompany you on your next trip. 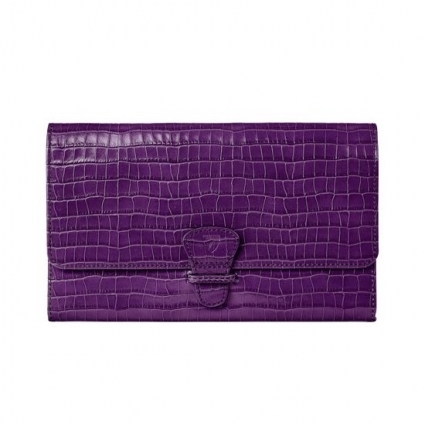 This sleek and sophisticated piece comes in a distinctive amethyst shade and is hand-crafted from the finest Italian calf leather in a small croc print. The deep glassy shine and textured feel of the exterior contrasts with the smooth suede lined interior, which includes four tabbed sections for your tickets, documents and passport. Slip your boarding pass into the open section, and foreign currency into the large gusseted compartment and zipped pocket. A tab closure neatly secures the contents.